I’ve now had a bit of time to put it together and created both an orientation version using the device accelerometer and also a touch event version (as whenever I showed someone the orientation one they tried to spin the cube with their finger!). Before you attempt to view the links you’ll need to be using either a tablet or mobile device and viewing in a browser that is WebKit powered as with the tutorial (iPhone, iPad and Android phones should be fine). Don’t start touching your computer monitor as nothing will happen (that was mostly for my Dad). The orientationChanged event is dispatched when the window changes from portrait to landscape and visa versa. deviceorientation then gives you the x / y / z orientation of the device. Next we’ll look at the touch event version which can be viewed here. Again the code is pretty simple as shown below. I’m planning on writing a simple tutorial for touch events so hopefully should have that up soon. Finally I put them both together to create this version that utilizes both device orientation and touch events. Thanks for the comment Jesse. I had the same conversation with a friend when I originally released this. I do want to point out that when I view the cube, and I rotate the top of my device away from me, the bottom of the cube rotates away from me. 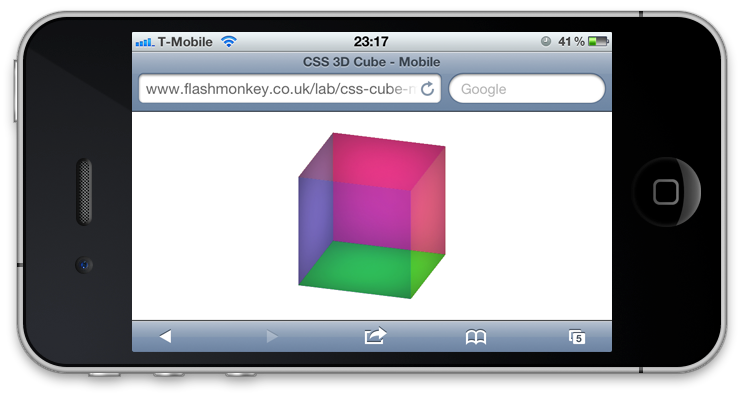 I expected the behavior of the cube to match my phone. The same for using my finger: it felt like I was spinning the cube from the rear instead of the front face of it. Looks like my MacBook has accelerometer as well. Works great. New York is great thanks mate! Send me a link to your version. I’ve been playing around with three.js recently – really nice library!